When we visited California over the summer, I fell in love with using walnuts in savory dishes. We had a few dishes that included them including grilled peaches and a delicious pasta dish. 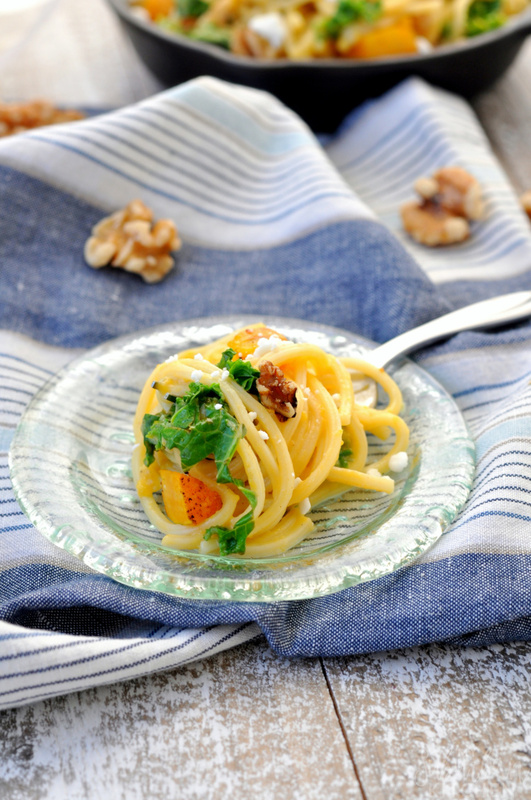 At home, I love using California walnuts in recipes like butternut squash, kale and walnut spaghetti. Walnuts are delicious and so versatile. I love using them in everything from dinner to dessert. In addition to omega-3 fatty acids, walnuts also offer 4 grams of protein and 2 grams of fiber per ounce. With their perfect crunch and and flavor combined with their health benefits, they are definitely the superior nut. 1. Preheat oven to 425 degrees. Line a rimmed baking sheet with nonstick foil. Add butternut squash to pan and drizzle with 1 1/2 Tbsp oil. Toss to coat. Season with salt, pepper and chili powder. Bake in preheated oven for 30-40 minutes or until tender. Remove from oven and let cool slightly. 2. Bring a large pot of water to boil over high heat. Season with salt and add spaghetti. Cook for 7 minutes. Reserve 1/2 cup of pasta water and then drain pasta. 3. Add 1 1/2 cups of cooked butternut squash to food processor or blender. Turn on machine and add reserved pasta water. Blend until mixed well. 4. Heat remaining 1/2 Tbsp oil in a large skillet over medium heat. Add garlic and crushed red pepper. Cook for 1-2 minutes or until fragrant. Add kale and cook for 2-3 minutes or it begins to wilt. 5. 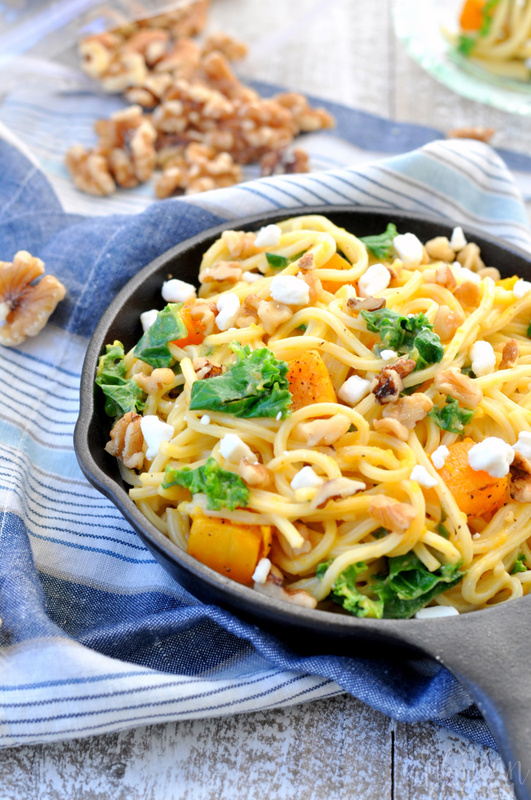 Toss hot pasta with butternut squash sauce, kale mixture, butternut squash cubes and walnuts. Top with additional chopped walnuts and goat cheese if desired. 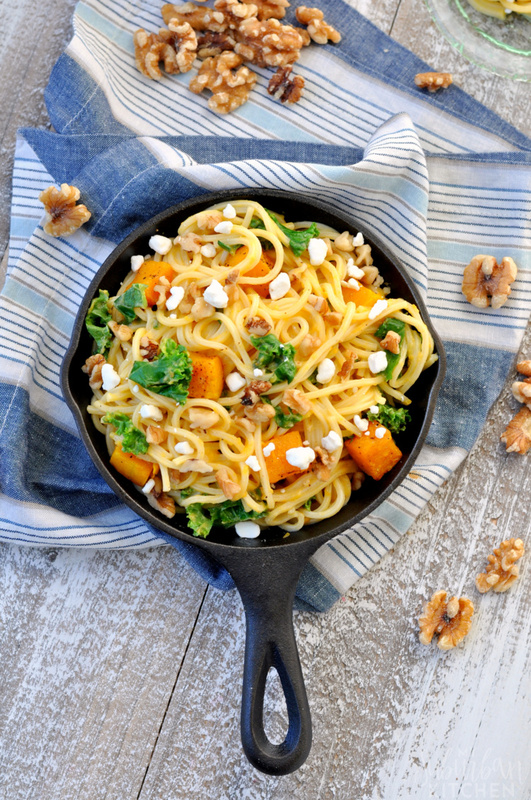 I love replacing a traditional spaghetti sauce with a vegetable based sauce and the walnuts go so perfectly with the butternut squash flavor. Plus, the walnuts add just the perfect amount of crunch to the dish. My whole family loves it. What are your favorite ways to incorporate California walnuts into your recipes? Are you excited about winter squash season? Preheat oven to 425 degrees. Line a rimmed baking sheet with nonstick foil. Add butternut squash to pan and drizzle with 1 1/2 Tbsp oil. Toss to coat. Season with salt, pepper and chili powder. Bake in preheated oven for 30-40 minutes or until tender. Remove from oven and let cool slightly. Bring a large pot of water to boil over high heat. Season with salt and add spaghetti. Cook for 7 minutes. Reserve 1/2 cup of pasta water and then drain pasta. Add 1 1/2 cups of cooked butternut squash to food processor or blender. Turn on machine and add reserved pasta water. Blend until mixed well. Heat remaining 1/2 Tbsp oil in a large skillet over medium heat. Add garlic and crushed red pepper. Cook for 1-2 minutes or until fragrant. Add kale and cook for 2-3 minutes or it begins to wilt. 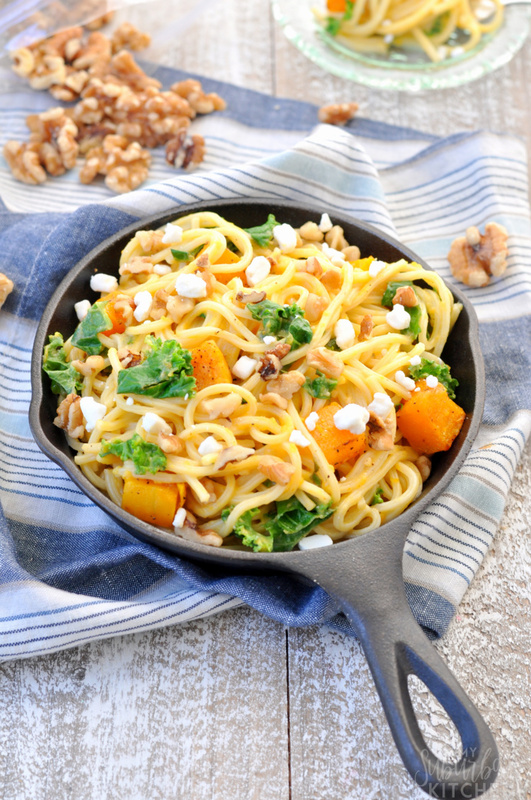 Toss hot pasta with butternut squash sauce, kale mixture, butternut squash cubes and walnuts. Top with additional chopped walnuts and goat cheese if desired. I see one of my lunches next week! Thanks for sharing on the What’s for Dinner link up and don’t forget to leave a comment at the party – Next week’s features that also leave a comment get pinned and tweeted! My favorite way to incorporate walnuts? You mean besides eating them straight out of the bag. Ha ha! What a great idea, Shannah! I never even thought of replacing a traditional spaghetti sauce with a bit of vegetable. I’ll have to give this one a try! Perfect way to eat more veggies 🙂 Thanks for sharing this with us on #shinebloghop today! This looks amazing- and simple enough for even me to do! This looks so tasty! Love all the autumnal colors and flavors in there!